Have you every thought that you knew a topic pretty well but then someone uses terminology that you aren’t used to? People that use Cisco a lot or live outside the MEF world use another terminology than people that are working on MEF certified networks. Even if we both know the concepts, if we don’t speak a common language it will be difficult to communicate and to the the right end result. When I took the CCDE written at Cisco Live, some of the QoS related material felt a bit off to me. I feel quite confident with QoS so this took me by surprise. My theory is that some of the material was written by someone coming from another background and uses some wording that just felt a bit off to me. I thought that I would read through some of the MEF material to broaden my QoS horizon and see what other terms are being used. At the very least I will have learned something new. If we start with the basics, we have flows in our networks and these flows have different needs regarding delay, jitter and packet loss. I will write different terms and I will indicate which belong to MEF terminology, the other terms will be related to what Cisco calls them or what they would be called in general outside of the MEF world. These all relate to how much delay that is acceptable in the network. It may be one-way or two-way requirements depending on the nature of the traffic. RTT always refers to the two-way delay. The MEF term is actually a bit clearer here as jitter is the variation of delay. Once again, MEF term is a bit clearer because we are interested to see the packet loss as a ratio, such as 1/100 packets which we then use as a percentage for what is acceptable loss on a circuit. The Bc or CBS value is used to define how much traffic in bits or bytes can be sent during each time interval. Picking a too low value can lead to customer dropping a lot of packets and picking a too high value can lead to long time intervals which could affect high priority traffic. The formula Tc = Bc / CIR can be used for calculations. 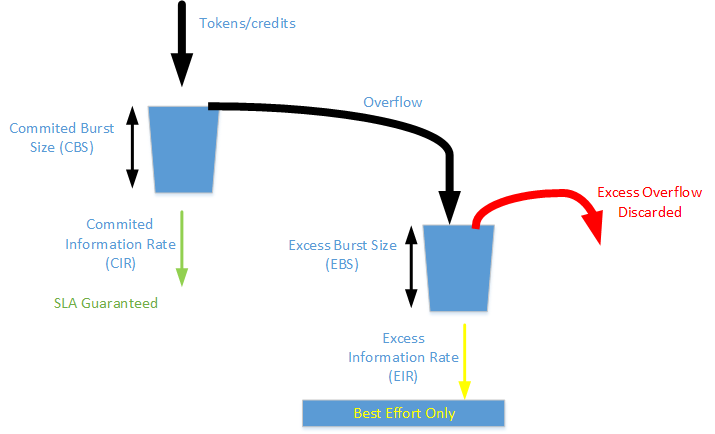 Be or EBS is normally used to provide the customer a more “fair” use of a circuit by allowing them to send unused credits from one or more previous time intervals. This means that they can burst momentarily until they have used up the Bc + Be credits. This is the rate that is guaranteed to the customer in the contract. The physical line rate could be 100 Mbit/s but the CIR is 50 Mbit/s. It should be noted that this is an average rate and that traffic is always sent at line rate which produces bursts of traffic. This means that the customer will for short periods of time send at above the CIR rate but on average they get CIR rate on the circuit. A provider/carrier may allow a customer to send at above CIR rate but only those packets that are within the CIR are guaranteed the performance characteristics as defined in the SLA. This is commonly implemented with a single rate Three Color Marker (srTCM) where packets that are within the CIR/CBS are marked as green, packets above CIR but within EIR/EBS are marked as yellow and packets that exceed the EIR/CBS are marked as red. Green packets are guaranteed performance as defined in the SLA, yellow packets get delivered according to best effort and red packets are dropped. As noted by Faisal in the comments. PIR is not the same as EIR. PIR is actually CIR + EIR which means that we have two token buckets filling at the same time and incoming packets are checked against both to see if it matches CIR rate or EIR rate which will then set the color of the packet to be green or yellow. One example could be where customer has CIR of 10 Mbit/s and EIR of 10 Mbit/s which gives a combined rate (PIR) of 20 Mbit/s. The first 10 Mbit/s is guaranteed and the other 10 Mbit/s is sent through the provider network as long as there is capacity available. This is a short post on different QoS terminology. Which terminology are you most used to? Trying to get my CCDE studies going again. I’ve finished the End to End QoS Design book (relevant parts) and here are my notes on QoS design. Classification and marking tools: Session, or flows, are analyzed to determine what class the packets belong to and what treatment they should receive. Packets are marked so that analysis happens a limited number of times, usually at ingress as close to the source as possible. Reclassification and remarking is common as the packets traverse the network. Policing, shaping and markdown tools: Different classes of traffic are alotted portions of the network resources. Traffic may be selectively dropped, delayed or remarked to avoid congestion when it exceeds the available network resources. Traffic can be dropped (policing), slowed down (shaped) or remarked (markdown) to conform. Congestion management or scheduling tools: When there is more traffic than available network resources it will be queued. For traffic classes that don’t react well to queueing they can be denied access by a scheduling tool to avoid lowering quality of the existing flows. Link-specific tools: Link fragmentation and interleaving fits into this category. IPv4 packet has 8-bit Type of Service (ToS) field, IPv6 packet has 8-bit Traffic Class field. The first three bits are IP Precedence (IPP) bits for a total of 8 classes. The first three bits in combination with the nex three is known as DSCP for a total of 64 classes. At layer two the most common marking is 802.1p Class of Service (CoS) or MPLS EXP bits, each using three bits for a total of 8 classes. Define business/organizational objectives of QoS deployment. This may including provisioning real-time services for voice/video traffic or guaranteeing bandwidth for critical business applications and also managing scavenger traffic. Seek executive endorsement of the business objectives to not derail the process later on. Based on the business objectives, determine how many classes of traffic is needed. Define an end-to-end strategy how to identify the traffic and treat it across the network. Analyze the requirements of each application class so that the proper QoS tools can be deployed to meet these requirements. Design platform-specific QoS policies to meet the requirements with consideration for appropriate Place In the Network (PIN). Test the QoS designs in a controlled environment. Begin deployment with a closely monitored and evaluated pilot rollout. The tested and pilot proven QoS designs can be deployed to the production network in phases during scheduled downtime. Monitor service levels to make sure that the QoS objectives are being met. The common mistake is to make it a technical process only and not research the business objectives and requirements. Classification: The identification of each traffic stream. Pre-queuing: Admission decisions, and dropping and marking the packet, are best applied before the packet enters a queue for egress scheduling and transmission. Queueing: Scheduling the order of packets before transmission. Post-queueing: Usually optional, sometimes needed to apply actions that are dependent on the transmission order of packets, such as sequence numbering(e.g. compression and encryption), which isn’t known until the QoS scheduling function dequeues the packets based on the priority rules. A trust boundary is a network location where packet markings are not accepted and may be rewritten. Trust domains are network locations where packet markings are accepted and acted on. QoS tools can mitigate the effects of worms and DoS attacks to keep critical applications available during an attack. Policer: Checks for traffic violations against a configured rate. Does not delay packets, takes immediate action to drop or remark packet if exceeding rate. Shaper: Traffic smoothing tool with the objective to buffer packets instead of dropping them, smoothing out any peaks of traffic arrival to not exceed configured rate. Policers make instantaneous decisions and should be deployed ingress, don’t transport packets if they are going to be dropped anyway. Policers can also be placed on egress to limit a traffic class at the edge of the network. Shapers are often deployed as egress tools, commonly on enterprise to SP links to not exceed the commited rate of the SP. Tail drop means dropping the packet that is at the end of an queue. The TX ring is always FIFO, if a voice packet is trying to get into the TX ring but it’s full it will get dropped because it’s at the tail of the queue. Random drop via Random Early Detection (RED) or Weighted Random Early Detection (WRED) tries to keep the queues from becoming full by dropping packets from traffic classes to cause TCP slowing down. Police as close to the source as possible, preferably on ingress. Strict priority: Lower priority queues are only served when higher priority queues are empty. Can potentially starve traffic in lower priority queues. Round robin: Queues are served in a set sequence, does not starve traffic but can add unpredictable delays in real-time, delay sensitive traffic. Weighted fair: Packets in the queue are weighted, usually by IP precedence so that some queues get served more often than others. Does not provide bandwidth guarantee, the bandwidth per flow varies based on number of flows and the weight of each flow. WRED is a congestion avoidance tool and manages the tail of the queue. The goal is to avoid TCP synchronization where all TCP flows speed up and slow down at the same time, which leads to poor utilization of the link. WRED has little or no effect on UDP flows. WRED can be used to set the RFC 3168 IP ECN bits to indicated that it is experiencing congestion. Critical applications like VoIP requires service guarantees regardless of network conditions. This requires to enable queueing on all nodes with a potential for congestion. Measurement based: Counting mechanism to only allow a limited number of calls (sessions). Normally statically configured by an administrator. Resource based: Based on the availability of resources in the network, usually bandwidth. Uses the current status of the network to base its decision. Resource Reservation Protocol (RSVP) is a resource based protocol, commonly used with MPLS-TE. The drawback of RSVP is that it requires a lot of state in the devices. AC functionality is most effectively deployed at aplication level such as with Cisco Unified Communications Manager (CUCM). It works well in networks with limited complexity and where flows are of predictable bandwidth. RSVP can be used in combination with Diffserv in an Intserv/Diffserv model where RSVP is only responsible for admission control and Diffserv for the queuing. A RSVP proxy can be used because end devices such as phones and video endpoints usually don’t support the RSVP stack. A router closest to the endpoint is then used as a proxy together with CUCM to act as an AC mechanism. Cisco recommends using RSVP Intserv/Diffserv model with a router-based proxy device. This allows for scaling of policies together with a dynamic network aware AC. IPv6 headers are larger in size so bandwidth consumption for small packet sizes is higher. IPv4 header is normally 20 bytes but IPv6 is 40 bytes. IPv6 has a 20-bit Flow Label field and 8-bit Traffic Class field. Modern applications can be difficult to classify and can consists of multiple types of traffic. Webex provides text, audio, instant messaging, application sharing and desktop video conferencing through the same application. NBAR2 can be used to identify applications. Consists of NBAR2, Flexible Netflow (FNF) and MQC. NBAR2 is used to identify traffic through Deep Packet Inspection (DPI), FNF reports on usage and MQC is used for the configuration. FNF uses Netflow v9 and IPFIX to export flow record information. It can monitor L2 to L7 and identify apps by port and through NBAR2. When using NBAR2, CPU usage may increase significantly as well as memory usage. This is also true for FNF. Consider the performance impact before deploying it. May use jitter buffers to reduce the effects of jitter, however it does add delay. Voice packets are constant in size which means bandwidth can be provisioned accurately. Don’t forget to account for L2 overhead. Flows are usually unidirectional and include application level buffering. Does not have strict jitter or latency requirements. This class may be subject to policing and remarking. Applications in this class can be Enterprise Resource Planning (ERP) or Customer Relationship Management (CRM). Example applications are e-mail, backup operations, FTP/SFTP transfers, video and content distribution. Example traffic is Youtube, Xbox Live/360 movies, iTunes, Bittorrent. Control plane traffic can be divided into Network Control, Signaling and Operations/Administration/Management (OAM). Do not enable WRED. Example traffic is EIGRP, OSPF, BGP, HSRP and IKE. Do not enable WRED. Example traffic is SCCP, SIP and H.323. Do not enable WRED. Example traffic is SSH, SNMP, Syslog, HTTP/HTTPs. This picture shows how different size models can be expanded or vice versa. The primary role of QoS is campus networks is not to control latency or jitter, but to manage packet loss. Endpoints normally connect to the campus at high speeds, it may only take a few milliseconds if congestion to overrun the buffers of switches/linecards/routers. Conditionally trusted endpoints: Cisco IP phones, Cisco Telepresence, Cisco IP video surveillance cameras, Cisco digital media players. Trusted endpoints: Centrally administered PCs and endpoints, IP video conferencing units, managed APs, gateways and other similar devices. Untrusted endpoints: Unsecure PCs, printers and similar devices. EtherChannel QoS will vary by platform and some policies are applied to the bundle and some to the physical interface. The probability for congestion on ingress is less than on egress. Enable trust on ports leading to network infrastructure and similar devices. 802.11e Working Group (WG) proposed QoS enhancements to the 802.11 standard in 2007. This was also revised in IEEE 802.11-2012. Wi-Fi Alliance has a compatibility standard called Wireless Multimedia (WMM). In Wi-Fi networks only one station may transmit at a time, physical constraints that are not in place on wired networks. The Radio Frequency (RF) is shared between devices. This is similar to a hub environment. Wireless networks operate at variable speeds. Distributed Coordination Function (DCF) is responsible for scheduling and transmitting frames onto the wireless medium. Wirless uses Carrier Sense Multiple Access/Collision Avoidance (CSMA/CA). It actively tries to avoid collisions. A wireless client has a random period where it may send traffic to try to avoid collisions. 802.11e Ethernet frame uses 3-bit field known as User Priority (UP) for traffic marking. It is analogous to 802.1p CoS. One difference is that voice is marked with UP 6 as compared to CoS 5. Interframe spacing is a time the client needs to wait before starting to send traffic, the wait time is lower for higher priority traffic. The contention window is used when the wireless media is not free, higher priority traffic waits a shorter period of time before trying to send again than lower priority data. TXOP is a period of time when the client is allowed to send to not make it hog up the media for a long period of time. TSpec is used for admission control, the client sends it requirements such as data rate, frame size to the AP and the AP only admits it if there is available bandwidth. Upstream QoS is packets from the wireless network onto the wired network. Downstream QoS is packets from the wired network onto the wireless network. Wireless marking may not be consistent with wired markings so mapping may have to be done to map traffic into the correct classes on the wired network. A frame with 802.1p CoS marking arrives a WLC wired interface. DSCP value of the IP packet is used to set the DSCP of the outer CAPWAP header. The 802.1p CoS value is not used in the above process. Primary goal is to manage packet loss. A few milliseconds of traffic during congestion can cause buffer overruns. Minimal or no QoS requirements because the goal of the architecture is to introduce as little delay as possible using low latency platforms such as the Nexus. Have similar QoS needs as a campus network. The goal is to process large and complex data sets that are too difficult to handle by traditional data processing applications. High-Throughput Computing: Also uses large amounts of computing power but for a larger period of time. More focused on operations per month or year. Grid: A federation of computer resources from multiple locations to reach a common goal. A distributed system with noninteractive workloads that involve a large number of files. Compared to HPC, Grid is usually more heterogenous, loosely coupled and geographically dispersed. VMDC comes with unique requirements due to compute and storage virtualization, including provisioning a lossless Ethernet service. Lossless compute and storage virtualization protocols such as RoCE and FCoE need to be supported as well as Live Migration/vMotion. Virtualization is leveraged to support multitenants over a common infrastructure and this affects the QoS design. SMDC has similar needs as VMDC but a different marking model. A framework used to build elastic data centers that host a few applications that are distributed across thousands of servers. Geographically distributed homogenous pools of compute and storage. The goal is to maximize throughput. Common to use a leaf and spine design. IEEE 802.1 Data Center Bridging Task Group has defined enhancements to Ethernet to support requirements of converged data center networks. Priority Flow Control (802.1Qbb): PFC provides link level flow control mechanism that can be controlled independently for each 802.1p CoS priority. The goal is to provide zero frame loss due to congestion in DCB networks and mitigating Head of Line (HoL) blocking. Uses PAUSE frames. The buffers used for this are called skid buffers and usually engineered on a per port basis in hardware on ingress. An incast flow is a flow from many senders to one receiver. Artifically induce congestion on ingress ports where there is an incast flow going to a host. This lessens the need for deep buffers on egress. VOQ consumes congestion at every ingress port and optimizes switch buffering capacity for incast flows. It does not consume fabric bandwidth only to be dropped on the egress port. Uses a virtual lane concept on a DCB enabled NIC, also called Converged Network Adaptor (CNA). Each virtual interface queue is accountable for managing its alloted bandwidth for its traffic group. If a group is not using all its bandwidth it may be used by other groups. Layer two traffic management system that pushes congestion to the edge of the network by instructing rate limiters to shape the traffic that is causing congestion. The congestion point such as a distribution switch connecting to several access switches can instruct these switches called reaction points to throttle the traffic by sending control frames. DCBX can be used between switches and with some endpoints. A goal of the data center is to maximize the goodput which is the application level throughput excluding protocol overhead. Goodput is reduced by TCP flow control and congestion avoidance, specifically TCP slow start. Supports direct memory access of one computer into another over converged Ethernet without involving either one’s operating system. Permits high-throughput low-latency networking, especially useful in massively parallel computer clusters. It’s a link layer protocol that allows communcation between any two hosts in the same broadcast domain. RoCE requires lossless service via PFC. When implemented along with FCoE, it should be assigned its own no-drop class/virtual lane, such as CoS 4. Other applications such as video using CoS 4 need to be reassigned to improve RoCE performance. Extends the reach of RDMA over IP networks. Does not require lossless service because it runs over TCP or STCP which uses reliable transport. It can be marked to unused CoS/DSCP or combined with internetwork control (CS6/CoS 6) or network control (CS7/CoS 7). Virtual Machines (VMs) require control traffic to be passed between hypervisors. VM control is control plane traffic and should be marked to CoS 6 or CoS 7, depending on QoS model in use. Protocols that support the process of moving a running VM (or application) between different phsycical machines without disconnecting the client or the application. Memory, storage and network connection are moved from original host matchine to the destination. A common example being vMotion. Can be argued to be a candidate for internetwork control (CoS 6) due to being a control plane protocol but sends too much traffic to be put in that class. Use an available marking or combine with CoS 4, CoS 2 or even CoS 1. Encapsulates Fibre Channel (FC) frames over Ethernet networks, requires lossless service and is a layer two protocol that can’t be natively routed. Requires lossless service via PFC and usually marked with CoS 3 which should be dedicated for FCoE. Encapsulates SCSI commands within IP to enable data transfers. Can be used to transmit data over LANS, WANS or even the Internet and can enable location independent data storage and retrieval. Does not require lossless service due to using TCP. Can be provisioned in dedicated class or in another class such as CoS 2 or CoS 1. Some platforms and interface modules do not support FCoE such as Nexus 7k M-Series module but F-series do. M-series module can connect to CUCM and multimedia streaming servers and F-series modules to DCB extended fabric supporting FCoE. Signaling and multimedia streaming can be classified by DSCP values (CS3 and AF3) to be assigned to queues and FCoE can be classified by CoS 3 to its own dedicated queue. Asymmetrical meaning the that the three bits forming the CoS do not match the first three bits of the DSCP value. Signaling could be marked with CoS 4 but DSCP CS3. Perform ingress and egress DSCP mutation on data center to campus links. Signaling and multimedia streams can be assigned DSCP values that map to CoS 4 (rather than CoS 3). Allow signaling and FCoE to coexist in CoS 3. The reasoning being that if the CUCM server has CNA then both signaling and FCoE will be provided a lossless service. Trust L2/L3 markings sent on application servers. Only approved servers should be deployed in the DC. Do not trust markings, reset markings to 0. Same as the untrusted server model but remarked to a non zero value. Access-lists are used for classification and traffic is marked to multiple codepoints. Application server does not mark traffic at all or it marks it to different values than the enterprise QoS model. One or more application classes are metered via one-rate or two-rate policers, with conforming, exceeding and optionally violating traffic marked to different DSCP values. Provision lossless service to FCoE. Packet jitter is most apparent at WAN/branch edge because of downshift in link speeds. Serialization delay is the time it takes to convert a layer two frame into electrical or optical pulses onto the transmission media. The delay is fixed and a function of the line rate. Propagation delay is also fixed and a function of the physical distance between endpoints. The gating factor is speed of light at 300 000km/s in vacuum but speed in fiber circuits is around a third of that. Propagation delay is then approximately 6.3 microseconds per km. Propagation delay is what makes up most of the network delay. Queuing delay is variable and a function of whether a node is congested or not and if scheduling policies have been applied to resolve congestion events. The Tx-Ring is the final IOS output buffer for an interface, it’s a relatively small FIFO queue that maximizes physical link bandwidth utilization by matching the outbound packet rate on the router with the physical interface rate. If the size of the Tx-Ring is too large, packets will be subject to latency and jitter while waiting to be served. If the Tx-Ring is too small the CPU will be continually interrupted, causing higher CPU usage. Some applications like Telepresence may be bursty by nature, the burst value may have to be adjusted to account for this. A basic point-to-point service characterized by low frame delay, frame delay variation and frame loss ratio. Service multiplexing is not allowed. No CoS bandwidth profiling is allowed, only a Committed Information Rate (CIR). Multiplexing of EVCs is allowed. The individual EVCs can be defined with different bandwidth profiles and layer two control processing methods. A multipoint service connecting customer endpoints and acting as a bridged Ethernet network. It is based on multipoint EVC and service multiplexing is allowed. It can be configured with a CIR, Committed Burst Size (CBS) and Excess Information Rate (EIR). A point-to-multipoint version of the E-LAN, essentialy it’s a hub and spoke topology where the spokes can only communicate with the hub but not each other. Common for franchise operations. If the Bc of the shaper is set too high, packets may be dropped by the policer even though the shaper is shaping to CIR of the service. When using sub line rate there will be no congestion on the interface, congestion is artificially induced by using a shaper and then a nested policy for the queuing. This may be referred to as Hierarchical QoS (HQoS). MPLS VPNs offer a full mesh of connectivity between campus and branch networks. This fully meshed connectivity has implications for the QoS design. Previously WANs were usually point-to-point or hub and spoke which made the QoS design simpler. Branch to branch traffic would pass through the hub which controlled the QoS. When using MPLS VPNs traffic from branch to branch will not pass the hub meaning that QoS needs to be deployed on all the branches as well. However, this is not enough, contending traffic may not be coming from the same site, it could be coming from any site. To overcome this the service provider needs to deploy QoS policies that are compatible with the enterprise policies on the PE routers. This is a paradigm shift in QoS administration and requires the enterprise and SP to jointly administer the QoS policies. Uniform mode is generally used when the customer and SP share the same Diffserv domain, which would be the case for an enterprise deploying MPLS. Uniform mode is the default mode. The first three bits of the IP ToS field are mapped to MPLS EXP bits on the ingress PE when it adds the label. If a policer or other mechanism remarks the MPLS EXP value this value is copied to lower level labels and at the egress PE the MPLS EXP value is used to set the IPP value. It is used when customer and SP are in different Diffserv domains. This mode is useful when the SP wants to enfore its own Diffserv policy but the customer wants its Diffserv information to be preserved across the MPLS VPN. The ingress PE sets the MPLS EXP value based on the SPs policies. Any remarking will only propagate to the MPLS EXP bits of labels but not to the IPP bits of the customers IP packet. On egress the queuing is based on the IPP marking of the customers packet, giving the customer maximum control. Pipe mode is the same as short pipe mode except for that the queuing is based on MPLS EXP bits at the egress PE and not on the customers IPP marking. 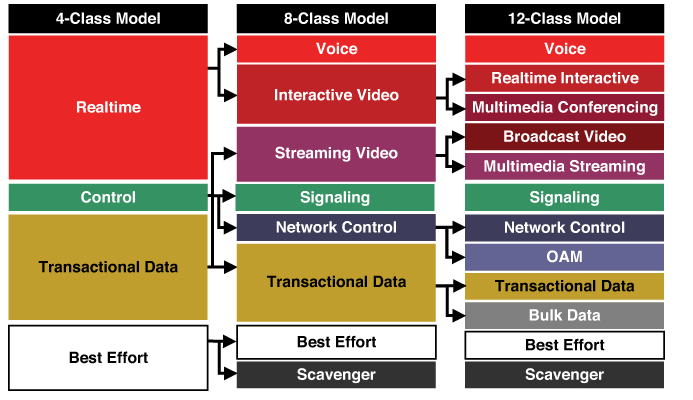 SPs often only a single real-time CoS, if you are deploying both real-time voice and video you will have to make a choice to put the video in the real-time class or not. Putting both voice and video into the real-time class may be costly or even cost prohibitive. You should still use a dual LLQ at the CE edge since that is under your control and that way you can protect voice from video. Downgrading video to a non real-time class may only produce slightly lower quality which could be acceptable. Signaling should be separated from data traffic if possible since the signaling could get dropped if the class is oversubscribed and thus producing voice/video instability. If the SP does not offer enough classes to put signaling in its own, consider putting it in the real-time class since these flows are lightweight, but critical. It is generally best to not mix TCP-based traffic with UDP-based traffic (especially if the UDP traffic is streaming video such as broadcast video) within a single SP CoS. These protocols behave differently under congestion. Some UDP applications may have application-level windowing, flow control and retransmission capabilities but most UDP transmitters are oblivious to drops and don’t lower transmission rates due to dropping. When TCP and UDP share a SP CoS and that class experiences congestion, the TCP flows continually lower their transmission rates, potentially giving up their bandwidth to UDP flows that are oblivious to drops. This is called TCP starvation/UDP dominance. Even if enabling WRED the same behavior would be seen because WRED (primarily) manages congestion only on TCP-based flows. If packets need to be remarked to fit with the SP CoS model, do it at the CE edge on egress. This requires less of an effort than doing it in the campus. To restore DSCP markings, traffic can be classified on ingress on the CE edge via DPI. Default IPSEC mode of operation on Cisco IOS routers. The entire IP packet is protected by IPSEC, the sending VPN router encrypts the entire original IP packet and adds a new IP header to the packet. It supports multicast and routing protocols. Often used for encrypting peer-to-peer communications, does not encase the original IP packet into a new packet. Only the payload is encrypted while the original IP header is preserved, in effect being copied to outside of the new IP packet. Because the header is left intact its not possible to do multicast or routing protocols in transport mode. 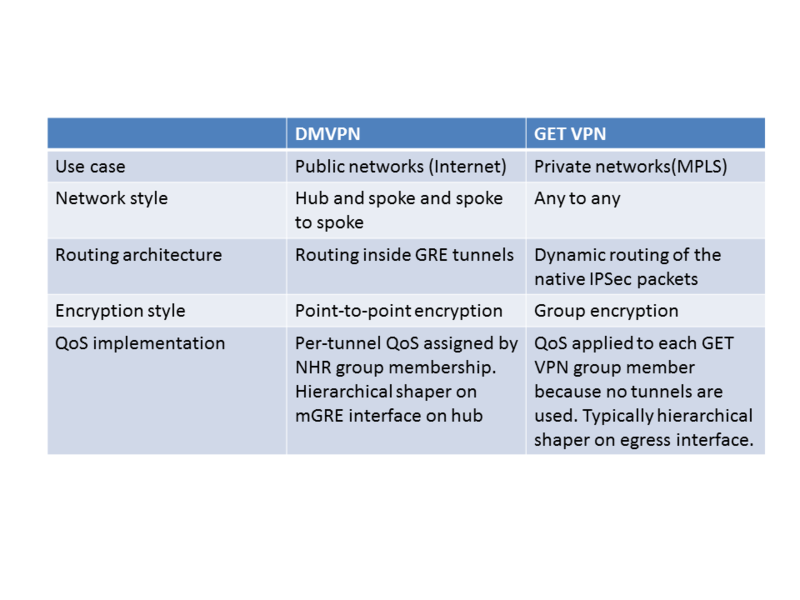 GRE can be used to enable VPN services that connect disparate networks. It’s a key building block when using VRF Lite, a technology allowing related Virtual Routing and Forwarding (VRF) instances running on different routers to be interconnected across an IP network, while maintaining their separation from both the global routing table and other VRFs. When using GRE as a VPN technology, it is often desirable to encrypt the GRE tunnel so that privacy and authentication of the connection can be ensured. GRE can be used with IPSEC tunnel mode or transport mode but if the tunnel transits a NAT or PAT device, tunnel mode is required. Cisco’s primary remote-access VPN client is AnyConnect Secure Mobility Client, which supports both IPSEC and Secure Sockets Layer (SSL) encryption. Anyconnect uses Data Transport Layer Security (DTLS) to optimize real-time flows over SSL encrypted tunnel. Anyconnect connects to remote headend concentrator (such as an ASA firewall) through TCP-based SSL. All traffic from the client including voice, video and data traverses the SSL TCP connection. When TCP loses packets it pauses and waits for them to be resent, this is not good for real-time UDP based packets. DTLS is a datagram technology, meaning it uses UDP packets instead of TCP. After Anyconnect establishes the TCP SSL tunnel it also establishes an UDP-based DTLS tunnel which is reserved for the use of real-time applications. This allows RDP voice and video packets to be sent unhindered. In case of packet loss, the session does not pause. The decision on which tunnel to send the packets to is dynamic and made by the Anyconnect client. Cisco routers by default copy the the ToS field from the original IP packet and write it into the new IPSEC packet header, thus allowing classification to still be accomplished by matching DSCP values. The same holds true for GRE packets as well. The IP packet is encrypted so it’s not possible to match on other fields such as IP addresses, ports, protocol and so on without using another feature. Normally tunneling and encryption takes place before QoS classification in the order of operations, QoS preclassify reverses the order so that classification can be done on the IP header before it gets encrypted. Actually the order isn’t really reversed but the router clones the original IP header and keeps it in memory so that it can be used for QoS classification after tunneling and encryption. This feature is only applicable on the encrypting routers outbound interface (physical or tunnel). Downstream routers can’t make decisions on the header because the packet will be encrypted at that point. Always enable the feature since tests have shown that it has very little impact on the routers performance to enable it. When tunneling technologies are used there is always the risk of exceeding the MTU somewhere in the path. Unless jumbo frames are available end-to-end, MTU issues will almost always need to be addressed when dealing with any kind of VPN technology. Common symptoms when having MTU issues is that applications using small packets such as voice work but not e-mail, file server connections and many other applications. Path MTU Discovery (PMTUD) can be used to discover what the MTU is along the path but it relies on ICMP messages which may be blocked on intermediary devices. TCP Maximum Segment Size (MSS) is the maximum amount of payload data that a host is willing to accept in a single TCP/IP datagram. During a TCP connection setup between two hosts (TCP SYN), the MSS for each side of the connection is reported to each other. It’s the responsibility of the sending host to limit the size of the datagram to a value less than or equal to the receiving hosts MSS. For an IP packet that is 1500 bytes and using TCP, the MSS is 1460 bytes, 20 bytes for IP and 20 bytes for TCP excluded from the 1500 byte packet. Two hosts may not be aware they are communication through a tunnel and send a TCP SYN with MSS 1460 but the MTU may be lower. TCP Adjust-MSS can rewrite the MSS of the SYN packet so that when the receiving hosts gets it, the value is set to something lower to be able to send traffic through the tunnel without fragmentation. The receiving host will then reply with this value to the sender host. The router is acting as a middleman for the TCP session. Adjusting MSS is a CPU intensive process. Enable it at remote sites rather than headend since it might be terminating a lot of tunnels. Adjusting MSS only needs to be done at one point in the path. TCP Adjust-MSS only has impact on TCP packets, UDP packets are less likely to be of large size compared to TCP. Wide Area Application Services (WAAS) is a WAN accelerator, it uses compression technologies such as LZ compression, Date Redundancy Elimination (DRE) and specific Application Optimizers (AO). This significantly reduces the amount of data send over the WAN or VPN. For a technology like WAAS to work, the compression must take place before encryption. Compression technologies can have a significant effect on the QoE but it works mainly for TCP traffic. Some WAN acceleration solution may break classification if the traffic is tunnel so that the original IP header is obfuscated. WAAS only compresses the data partion of the packet and keeps the header intact leaving the ToS byte available for classification. To improve voice quality over bandwidth constrained VPN links, administrators may use compression codecs such as ILBC or G.729. G.729 uses about a third of the bandwidth of G.711 but this also increases the effect of packet loss since more data is lost in every packet. To overcome this when the a packet is lost and the jitter buffer expires, the voice from the previous packet can be replayed to hide the gap, essentially tricking the listener. Through this technology, up to 5% of packet loss can be acceptable. Internet Low Bitrate Codec (ILBC) uses 15.2 Kbit/s or 13.33 Kbit/s and performs similarly to G.729, the Mean Opinion Score (MOS) for ILBC is significantly better though when there is packet loss. Compress Real-Time Protocol (cRTP) is not compatible with IPSEC because the packets are already encrypted when cRTP would try to compress them. When ESP authentication is configured in an IPSEC transform set, every Security Association (SA) keeps a 64-packet sliding window where it checks the incoming sequence number of the encrypted packets. This is to stop from someone replaying packets and is called connectionless integrity. If packets arrive out of order due to queuing it must fit inside the window or the packet will be drop and seen as antireplay error. A data packet may get stuck behind voice in a queue so that it misses to fit inside its sliding window and then the packet would get dropped. To overcome this use a line in the ACL for every type of traffic such as voice, data, video. This will create a SA for each type of traffic. TCP will be affected by packet loss, it will not know that the packets are dropped due to antireplay. Antireplay drops are around 1 to 1.5% on congested VPN links with queuing enabled. A CBWFQ policy will often hold 64 packets per queue, decreasing this will lead to fewer antireplay drops as the packets are dropped before traversing the VPN but it may also increase the CPU usage. mGRE: Multi-point GRE allows a single tunnel interface to server a large number of remote spokes. One outbound QoS policy can be applied instead of one per tunnel as with normal GRE which is point-to-point. Dynamic discover of IPSEC tunnel endpoints and crypto profiles: Dynamic creation of crypto maps, no need to statically build crypto map for each tunnel endpoint. NHRP: Allows spoke to be configured with dynamically configured IP address. Also enables zero-touch deployment that makes DMVPN spokes easy to set up. Think of the hub router as a “next-hop server” rather than a traditional VPN router. NHRP is also used for per tunnel QoS feature. Allows the administrator to enable QoS on a per-tunnel or per-spoke basis. QoS policy is applied to the mGRE tunnel interface. This protects spokes from each other and keeps one spoke from using all the BW so that there is none left for the others. The QoS policy at the hub is automatically generated for each tunnel when a spoke registers with the hub. Queuing only kicks in when there is congestion, to signal to the routers QoS mechanism that there is congestion a shaper is used. Shape the traffic flows to the real VPN tunnel bandwidth to produce artificial back pressure. With per-tunnel QoS for DMVPN, a shaper is automatically applied by the system to each and every tunnel. This allows the router to implement differentiated services for the various data flows corresponding to each tunnel. This technique is called Hierarchical Queuing Framework (HQF). Using NHRP, multiple spokes can be grouped together to use the same QoS policy. This technique provides QoS in the egress direction of the hub towards the spokes. For QoS from the spokes to the hub, a QoS policy needs to be applied at the spokes. At this time it is not possible to have an unique policy for traffic between spoke to spoke due to spokes not having access to the NHRP database. Group Encrypted Transport (GET) VPN is a technology to encrypt traffic between IPSEC endpoints without the use of tunnels. Packets transmitted use IPSEC tunnel mode but it is not defined by traditional IPSEC SA. Because there are no tunnels, the QoS configuration is simplified. DMVPN is suitable for hub and spoke VPNs over a public untrusted network such as the Internet, GET VPN is suitable for private networks such as a MPLS VPN. A MPLS VPN is private but not encrypted and GET VPN can encrypt the traffic between the MPLS sites. GET VPN has no real concept of hub and spoke, which simplifies the QoS architecture. There is not one major hub aggregating all the remote sites and being liable to massive oversubscription. GDOI is a technology that supports any to any IPSEC VPN without the use of tunnels. There is no concept of SA between specific routers, instead it uses a group SA which is used by all the encrypting nodes in the network. There is no per tunnel QoS needed since it does not use tunnels, QoS is simply applied egress on each GET VPN router. GDOI control plane protocol uses UDP port 848 and ISAKMP on port UDP 500. These packets are normally marked DSCP CS6 by the router. Normally with IPSEC tunnel mode the ToS byte is copied to the new IP header but the original IP header is not preserved. On a public network such as the Internet it makes good sense to hide the source and destination IP addresses but GET VPN is deployed on MPLS networks which are private. GET VPN keeps the original IP header intact which simplifies QoS, dynamic routing and multicast. The packet is still considered an ESP IPSEC packet, not TCP or UDP, so to classify based on port numbers the QoS preclassify feature will still be needed. DMVPN has some drawbacks, spoke to hub tunnel is always up but spoke to spoke tunnels are dynamically brought up. This causes a delay which can take a second or two and may have negative impact on real-time traffic. The delay is not caused by NHRP or the packetization of the GRE tunnel but rather the exchange of ISAKMP messaging and the establishment of the IPSEC SAs between the routers. DMVPN could then be used solely for setting up GRE tunnels and GET VPN for encryption of the packets going into the tunnel. This then allows for fast establishment of tunnels and encrypting the packets, increasing the overall user experience. As part of my CCDE studies, I needed a good resource on QoS. There have basically been two good books on QoS before, the first edition of End to End Qos Network Design and Qos-Enabled Networks: Tools and Foundations. The first edition of this book is good but very dated, it was released back in 2004. Qos-Enabled Networks is a great book but it’s written to not be vendor specific, so you will not get details on platforms or configuration snippets. In my opinion, earlier books gave a good foundation to understand QoS concepts but there were too few design cases, they were lacking platform information and not enough examples to be able to act as a reference. Since the first edition of this book, a lot has happened, new products and new Places In the Network (PIN) such as Datacenter, Wireless and to some degree MPLS. The book is written by Tim Szigeti, Christina Hattingh, Robert Barton and Kenneth Briley Jr. Tim is a long time CCIE, technical leader at Cisco. He is the QoS gury responsible for a lot of the Cisco Validated Designs (CVDs) and a frequent presenter at Cisco Live. Christina is a former Technical Marketing Engineer (TME) at Cisco now acting as an independant, writing books, teaching and consulting. Robert is a senior Systems Engineer (SE), dual CCIE and CCDE. Kenneth is a CCIE, technical lead at Cisco, focusing on convergence of QoS for wired and wireless networks. This book was written of some of the best minds in the world on QoS, and it shows. The book is divided into different parts, the first part consists of an QoS overview and describes Diffserv, Intserv, classification and marking, policing, shaping, congestion management and avoidance, QoS in IPv6 networks and more. The book does a very good job of laying a good foundation for the reader to build on. It has nice graphics to explain queueing, policing, shaping and so on. Every chapter also has a “Further Reading” part if you want to dive deeper into a subject. The next part of the book is about business and application QoS requirements. What requirements does different applications have? How do you differentiate business critical apps on port 80 from bulk traffic? What are the design principles for QoS? How many classes should be deployed? The book tries to answer these questions, many books fall short on this part. After that there is a part on Campus QoS. This is where the book really starts to shine. It shows the difference between Multi Layer Switching (MLS) QoS and Modular QoS CLI (MQC), how to apply QoS on 3750, 4500 and 6500. What are the different trust states, where should you trust, where should you mark. It also shows how to apply QoS on Etherchannels and how it behaves on different platforms, information that can be difficult to find and hidden through multiple documents otherwise. It ends with a design case and in my opinion all books should be written like this. This shows the reader how to apply the different concepts and to think of how all pieces fit together. Then there is a part on wireless QoS, first an overview on how packets are scheduled on the radio, which standards that are relevant, why the earlier standards were not good enough and what has changed. QoS is shown on different platforms and controllers and at the end there is a case study. I don’t work much with wireless but if I did this would be a very good reference since earlier books don’t discuss wireless QoS. I was surprised to learn that there are some discrepancies in wireless QoS compared to 802.1p and DSCP. Datacenter QoS is in the next part and this is definitely a great addition compared to earlier books. It discusses the different Nexus platforms, what additions are needed in the Datacenter to be able to deliver lossless Ethernet and also ends with a case study. WAN and branch QoS design comes after that and this is probably what most readers will recognize as QoS. It has examples on the ISR G2 but also on the ASR1k and as usual ends with a case study. 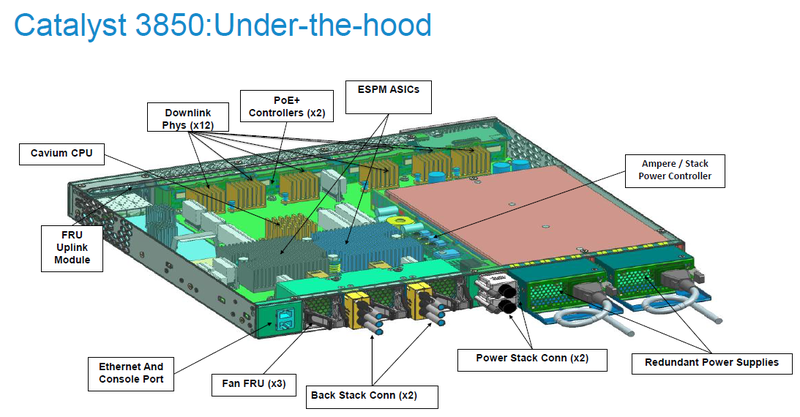 I really like the next part which is on MPLS QoS. This is not easy to find in other books. It explains the difference between short pipe, pipe and uniform mode. It also has examples on QoS on the ASR9k, CRS and also examples on how the customer should configure QoS when connecting to a Service Provider (SP). As usual a case study at the end. The final part of the book is on QoS in VPNs, such as IPSEC, GET VPN, DMVPN and connecting from a home office. This part is also difficult to find in other books so it’s great that it’s included in here. It also has a case study at the end. This book is written on some of the best people out there. It has a nice flow to it, it covers all the relevant areas of QoS. It covers different platforms and shows examples on how to configure QoS on these platforms. It can serve as book for learning more or for a certification or simply as a reference for all of your needs on QoS. This book is VERY extensive but it is so for a reason. It’s not long just for the sake of it, it’s all relevant material. Read it end to end or pick the parts you are interested in. If you want to get one book for QoS, get this one! If you are studying for the CCIE, this should be your reference. I can’t recommend this book enough, you’ll see the ratings on Amazon, Safari etc that everyone agrees that this is an awesome book. it’s not common knowledge that the shaper allows a deficit to be created. Their clocks have been synchronized to show the timing of the events going on. A policer does not allowed a deficit to be created. This can be proven very easily. number of tokens is taken from the Bc bucket and the packet is sent on its way. to the bucket at fixed intervals. any packets with a size over 1000 bytes will be dropped. 20 bytes of IP and 8 bytes of ICMP which is more than 1000 bytes in total. The policer does not allow a deficit to be created so all packets had to be dropped. If we ping with a 972 byte payload some packets should make it through. The policer shows that some packets have exceeded. it sent the packet at 10.195. The next packet is sent at 10.255 but this does not make it through the policer. With a CIR of 10 kbit/s, we can only send 1250 bytes every second. The router then waits for the ICMP packet to timeout which was set to one second. Then the next packet is sent at 11.255 and received at 11.287. Output from the other router shows it was sent at 11.255.
through or it is dropped. have a look at the timing of what happened. The Bc bucket starts out full so the packet is immediately transmitted. The interesting part is that R1 sent its second packet at 45.783. This packet was then received at 45.811. Once again output from the other router. R1 should not have been allowed to send this packet so quickly after the first one. next one. However a deficit was created to allow sending the packet more quickly. If we look at the five packets that R2 replied to we can see a pattern. there is a 1620ms gap. It is clear that at the end the router had to pay its dues. send packets rather than dropping them. What are your ideas? but now it’s offical. Lets look at some of the highlights of this new switch. If you want the full info check out BRKCRS-2887 from Cisco Live in London. IPv6 client mobility. IP base license level is required to use wireless capabilities. The stack supports 480Gbps and the fans and power supplies are field replacable. combinations up to 4x 10G, only supported on WS-C3850-48. 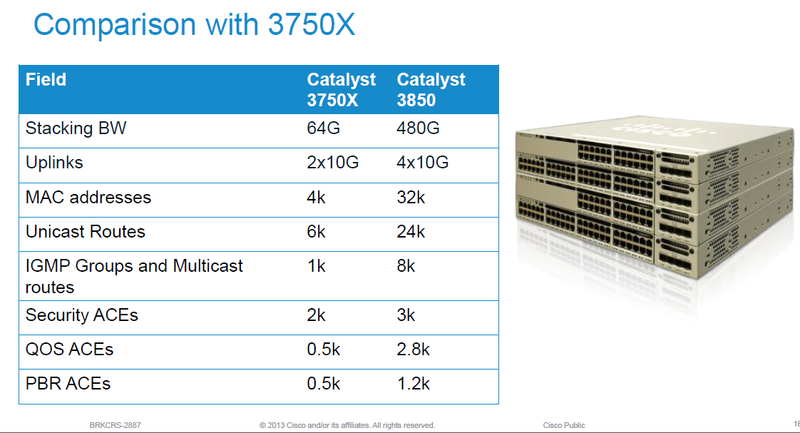 Here is a comparison to the 3750-X. As you can see it’s a pretty good improvement compared to the 3750.
features is that you can apply different QoS settings depending on the SSID. both wired and wireless needs. troubleshoot a live problem which is very good practice for the TS lab in the CCIE lab. instructor teaching you all these tips and tricks then that instructor is a fake. useful commands but there are no tips and tricks in routing protocols. talking to him for sure. Norway, Hungary were all represented. The bootcamp runs from 9 AM in the morning to about 19-20 PM in the evening. have some fun there will be time in the weekend for that. used since that is very similar to what is being used in the real lab. that you don’t get overwhelmed by the information in the bootcamp. etc in your labs so that you get used to using these technologies. Later in the week we moved on to IGPs. OSPF will be the main topic. offset-list, leak maps and authentication. After we were done with IGPs we moved on to route redistribution. This topic alone is enough to provide a good bootcamp experience. diagram and just look at it and identify potential issues. a full understanding of what is going on. TCP providing the authentication of packets and not BGP. He will explain concepts like hot potato vs cold potato routing. confederations and why you want to use the one or the other. explaining how deterministic MED works and always-compare-med. the youngest network is listed first. external route tag and DN bit works. go for some sightseeing or just do labs, the choice is yours. Just make sure that you are well rested for when monday comes. favourite topic and I learned a lot from this section. of understanding and that is why they go looking for tricks. few commands you can become very good with analyzing multicast. or lack of understanding of what is really going on. basic topologies and then moves on to some more advanced scenarios. with the added benefit that you can ask Brian questions of course. to use the share and shape queues for the SRR queues. friday and I probably missed a couple of hours in the end. could be a good option. for sure even if you were strong in these areas before.